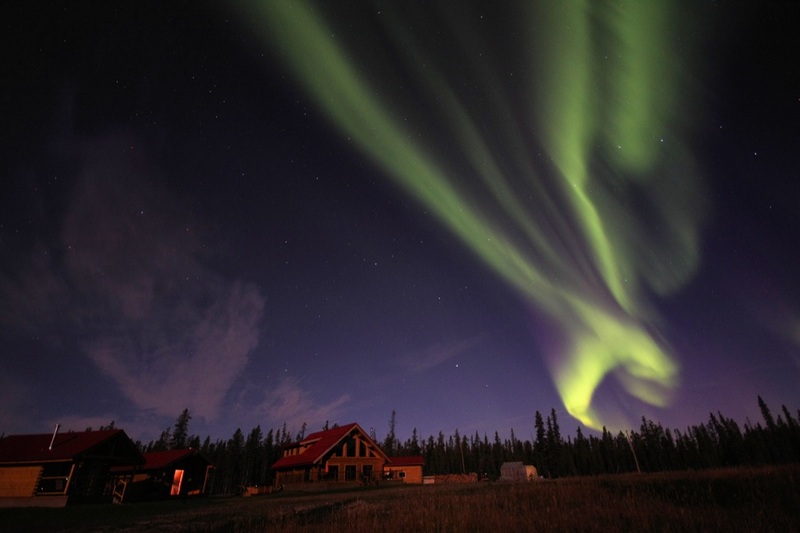 Aurora Borealis Itinerary for basic tour package combined with 3 nights in a cozy lodge in Whitehorse, Yukon. CAD$ 1329 + 5% GST per person, based on double occupancy. Single room supplement for $CAD 589 + 5% GST. 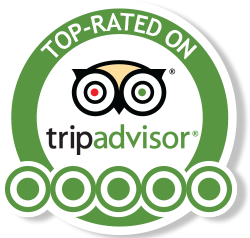 We'll welcome you at the airport and transfer you to your Hotel in downtown Whitehorse. The hotel is located within walking distance of all attractions, restaurants, banks and stores. We will have an informational meeting and registration for optional tours at the hotel. Take your time for fitting the winter clothing (optional), shopping and dinner on your own. At 10 pm departure for Aurora viewing. A cozy, heated cabin or wall tent with hot drinks and snacks makes your Aurora viewing even more enjoyable. Return to hotel around 2.30 am. In the morning at 10.00 am we are having a city tour including the following stops: Main Street, Train Depot of the White Pass and Yukon Route, Visitor Reception Center, Log Skyscraper, Log Church, Sternwheeler SS Klondike, Fish ladder, Schwatka Lake and some residential areas. Between 1.00pm and 3.00pm, we will bring you to the Northern Lights Resort & Spa. Relax, unwind and soak up the peaceful ambiance. 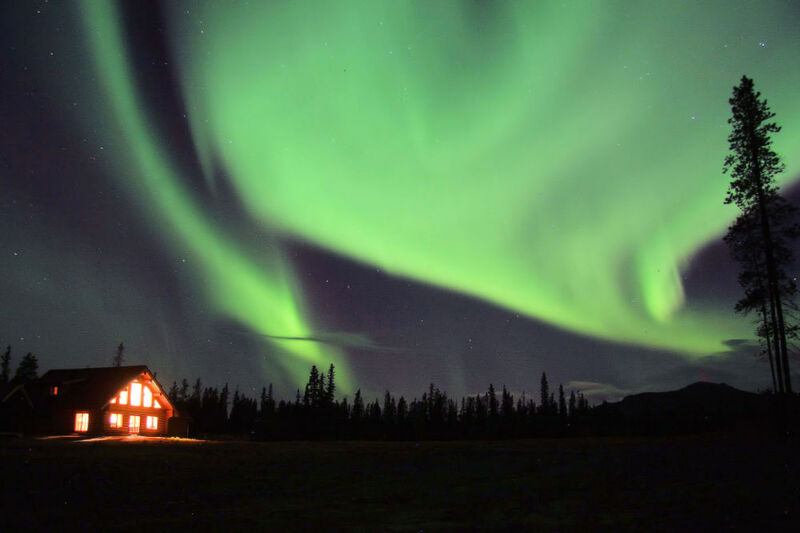 Located just 20 minutes south of Whitehorse, this little piece of paradise is the Yukon´s newest get-away destination - a hideaway located in a quiet open countryside close to the Yukon River, surrounded by pine forests and ringed by mountains. 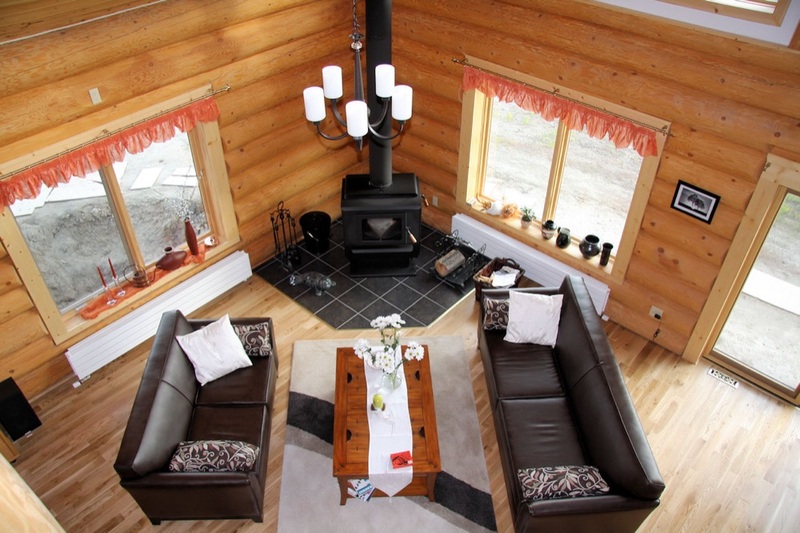 Built from massive Douglas Fir and to meet European standards by your German-Canadian hosts, the 3600 sq foot lodge features a luxurious great room for guest gathering, relaxing, breakfast and dinner use with a dramatic panoramic view of the Yukon River valley and the mountain range. 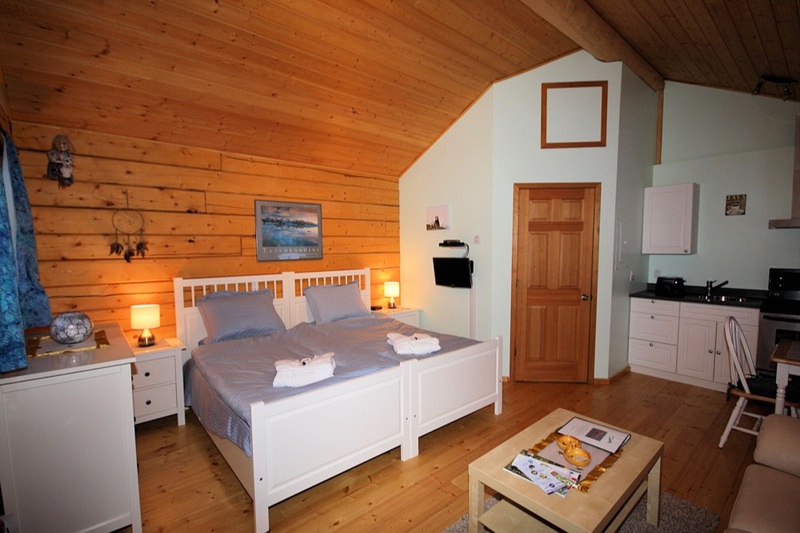 Guests stay in the cozy guest room with large en-suite bathroom in the lodge or in a well-appointed 320 sq/ft. cottage featuring a large living/bedroom with fireplace, adjacent kitchen and en-suite bathroom. The spa & wellness area is located in the main building and features a finish sauna, infrared sauna, whirlpool, rest room and a room for massage treatments. Wake up to a healthy European-style breakfast and the lodge in front of the fireplace. Talk with your host about breakfast times. Since you will be up late the night before, you may not want to have breakfast too early. Go for a snow shoe hike, or plan a day out dog sledding (optional tours).Enjoy the sauna and a customized massage treatment in our spa. Or simply relax in the outdoor hot tub on the large deck under the breathtaking northern sky. In the evening, after dinner, you may stay up late again to view the Aurora Borealis. Relaxing day at the resort. Check-out our list of optional day tours, if you are interested in experiencing a typical Yukon activity. Breakfasts, lunch and dinner at the resort. Breakfast at the lodge. The morning is at your leisure or you can plan an optional day tour (need to be booked in advance). Transfer back to your hotel in downtown at 11am or after your optional day tour. 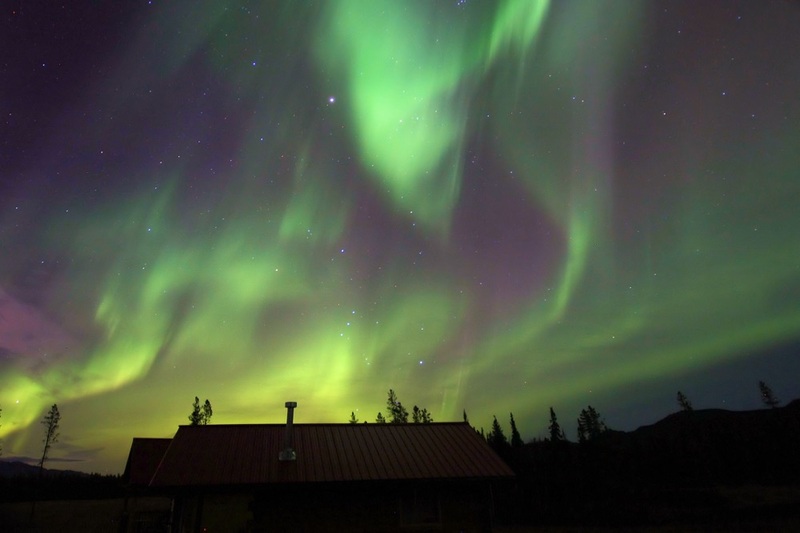 At 10 pm we will depart for your last night of Aurora viewing at the Northern Tales Trading Post. Return to the hotel around 2.30 am. Meals at the lodge (breakfast, lunch and dinner included); please inform us about any food restrictions and allergies in advance! Transfer by van to the dog kennel outside of Whitehorse. Here you’ll watch your guide harnessing your dogs and hitching them to the sled. The highlight of this excursion will be when you’ll run your own dog team for approximately 5 hours. Include: transfers, instruction, use of dogs and sled (2 person per sled), lunch and hot drinks, trail side fire.